Does your baby love playing in water? My son is crazy about water. What about pool time excitement? Nemit jumps in excitement every time we mention swimming pool to him. This post may contain affiliate links which means that if you purchase through these links I may earn a small commission. This is at no cost to you but is an awesome way to help me keep this site going. But the sad part is we don’t have a pool in our society and the one which is nearby our place don’t allow kids younger than 3 years. 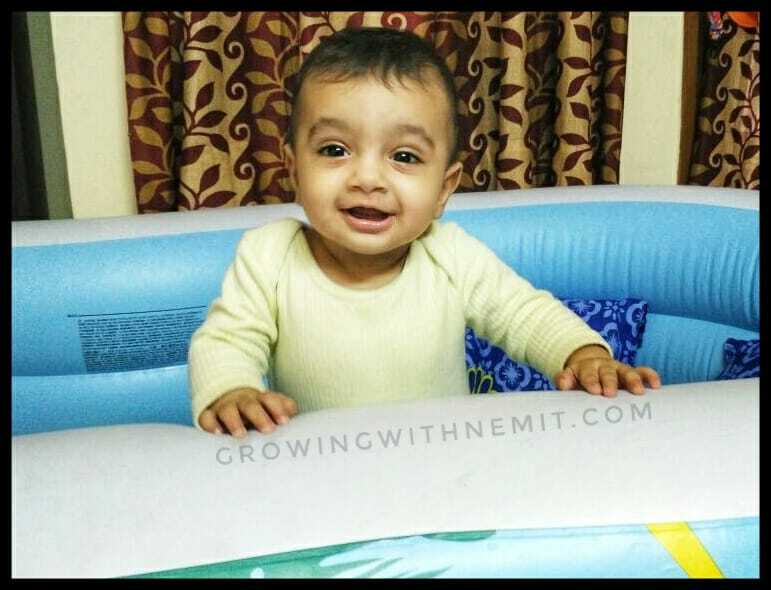 Nemit was around 5 months old when he started liking water and his bath time became a fun time for us. But then he was too young and couldn’t even sit properly, so we never bothered about taking him to a pool. He was 7 months old when he first experienced his outside pool visit during our trip to Goa. And we got the hint that this boy is gonna love pool even more as he grows up. Thankfully, we being pool freaks ourselves helped us to make Nemit’s first pool visit easy, safe and full of excitement. How? We also bought a baby float to see if he would like sitting in it or not. And then the time came to inflate the pool and fill it with water. And finally, to test the float and look for Nemit’s reaction. Luckily, Nemit loved the whole experience and we felt relieved and ready to take the boy for his first pool and beach holiday. And Goa it was! After that there was no stopping him from getting into the pool. 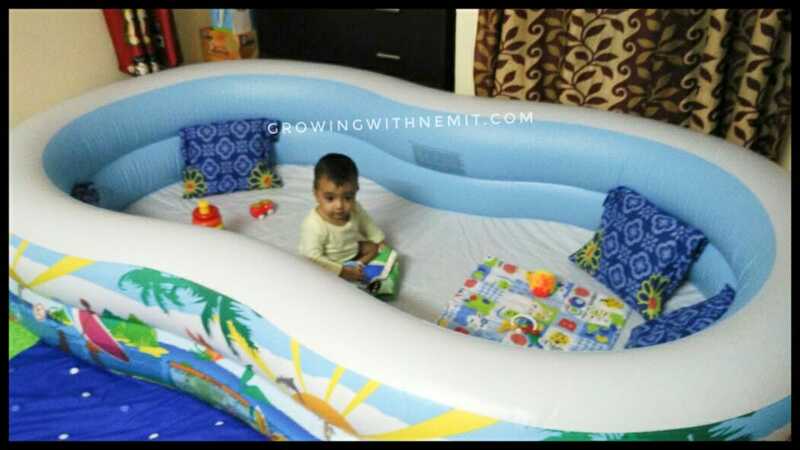 He enjoyed his room pool time after coming back from the vacation and later in winters we converted the water pool into a play pen. This idea was actually taken from Pinterest and we loved it totally! We were able to use this pool till Nemit started crawling and standing with support. You may also read: 5 quick tips when planning a vacation with kids and grandparents! 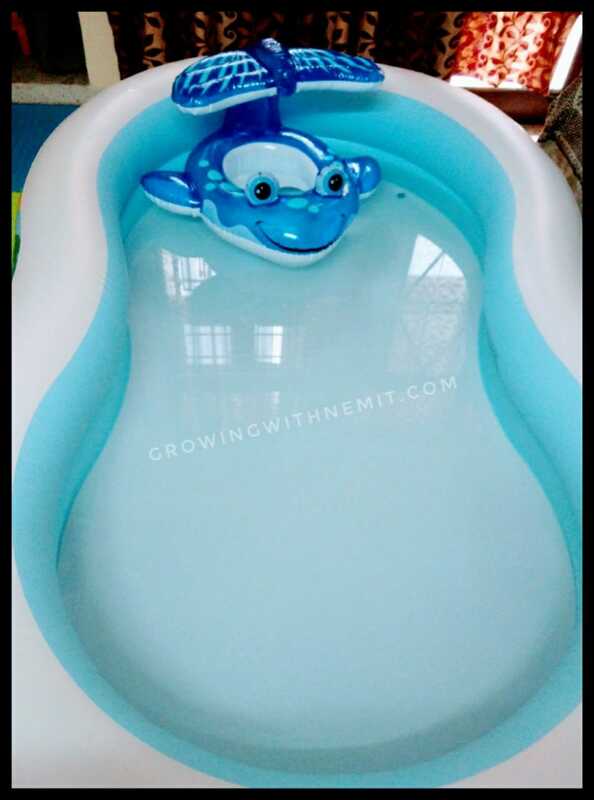 You can also buy such pool (small or big) and float (available in various shapes & designs) online through Amazon or any other e-commerce site. I have also shared the links above to make your search easy. Now he would not require a support float, he simply wanted to jump into the pool. He is 2.7 years old and doesn’t know how to swim but he has no fear at all. We, ourselves are big pool freaks as I said earlier and during almost all our trips, we keep at least one whole day at leisure. So that we can enjoy our time at the resort and in the swimming pool. I guess Nemit inherited this craziness for pool from his parents only (as if it flows in the genes, lol). Jokes apart, it’s really important for parents to be highly vigilant with kids in pool specially infants and toddlers. It’s been a week since we’ve returned back from our Pondicherry trip and I can’t wait to tell you how Nemit surprised us there with his crazy stunts in the pool. Watch this video and you will know! He was dancing in water, swimming and jumping, all in all he was having the best time. Whereas we were shocked and surprised to see him doing all this without any fear. It took us almost an hour to calm down and accept that there will be no stopping him now from enjoying his pool time. We had a super fun holiday and now our pool times have turned more entertaining. Also, it’s important that you plan ahead for pool time and pack the pool essentials for kids to make the pool time safe and fun for them. I can assure you that with these essentials you can have a worry free time and enjoy to the fullest. You will thank me later for this list. Then what are you waiting for guys, come on, read ahead! 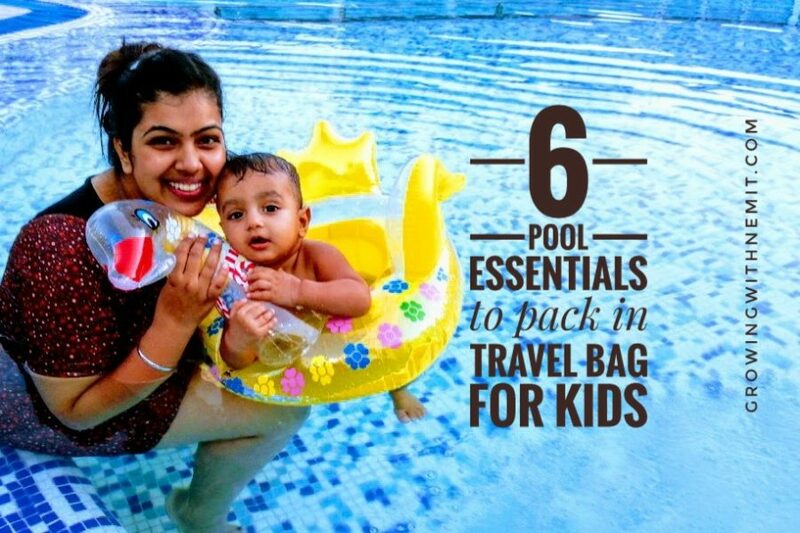 If you are planning a vacation and looking forward to your time at swimming pool with your kids, do check out the below list of pool essentials to pack in your travel bag. These are the must haves for babies and toddlers. Also, please note, while booking your hotel/resort, make sure to ask them about the pool accessories they provide for kids. However, it’s always better to have your own stuff to avoid any raw deal later on. These pool essentials won’t even take much space in your travel bag. I will also suggest to carry your own manual/electric air pump. This is a must if you have a baby or young toddler who can not stand on its own but old enough to sit. You can just put your little one in the float and be worry free and almost hands free. They will be much safer sitting inside the float rather than without anything or even in your arms, since it’s easy to lose balance in pool. Always remember if you are not a good swimmer don’t take your baby in the adult pool. It’s always better to make your child wear a good quality swim suit/bathing suit. For babies, consider buying a 2-piece swim wear as that’s easy to change in case of diaper checks. If you can get full length swim wear made of good quality material it’s a plus as that can help minimize the amount of UV rays that penetrate your child’s skin. If the pool is covered one or you are planning not to stay for a long time in the pool, simply opt for swimming trunks. 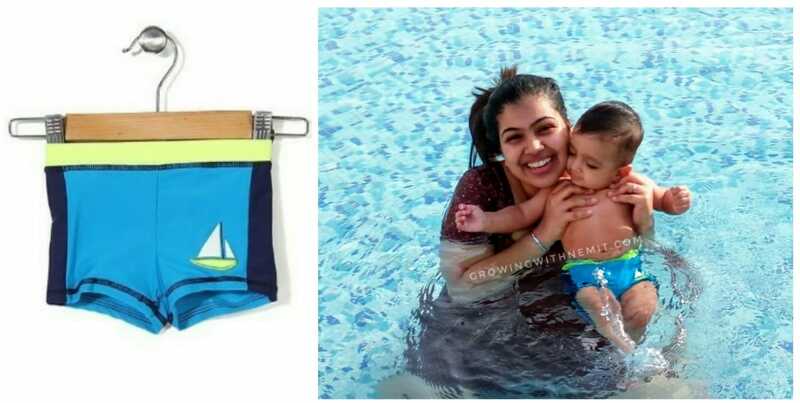 Swimming diapers are a must at least for babies and also toddlers who are not yet potty trained. There are a variety of diapers available to choose from, disposable or reusable, cloth diapers or just the diaper covers to be worn over the normal underpants. For older toddlers, who are ready to explore more about the swimming pool and don’t feel comfortable sitting in the float, consider buying an age appropriate ring float for them. That will keep them up and safe and also provide the necessary support in the pool water. There is one more option which we checked and that’s the inflatable pool jacket. If your child doesn’t like the ring and wants to be left free, try making him wear this jacket. This will help keep your child floating. While buying do check for the right size and before packing them in your travel bag, do check them once. Fill them with air, check for any leakage and also check their fit. It’s always better to be well prepared in case of children. Another important pool essential often neglected by many parents is a good sunscreen. To avoid sun burns, tanning, irritated skin do invest in a good sunscreen for kids. You can check out this post to know some of the best sunscreens for kids. Apart from the above mentioned must haves, don’t forget to keep separate towel for kids, hooded ones are the best. I also like kid’s bathrobes, keep them snugly while having out of pool fun. You can also add a few pool toys, they make the pool time even more wonderful. And lastly, always carry baby wash, so that you can give them a good bath once they are out of the pool & apply moisturizer. So, that’s my list of pool essentials especially curated for my lovely readers. 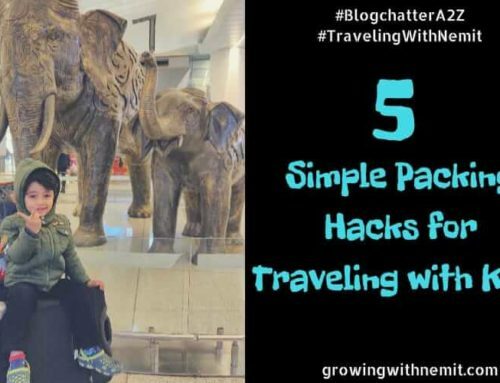 Hope this will help you pack better for your next vacation. And you will not worry about spending time at pool with your beautiful kids. Do share this post with your friends and family. And now tell me in the comments below when did you take your baby to the pool for the first time? Such a. Beautiful post, if water is introduced to kids early, they love it and develop no fears. Same was the progression of my child who loves his pool time the most now. 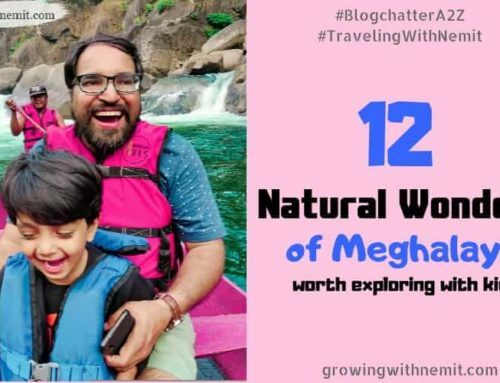 A very detailed and very helpful post for all those parents who are taking their kids to vacation and want to enjoy pool time. Written with great attention to detail by a loving mother. A must read for all mommies and daddies. Thank you so much for your kind words of appreciation. I really hope this post will encourage new parents to take their babies to the pool and not shy away from having some fun time. Interesting post Neha. Thanks to Alexa that I am able to discover the variety of blogs. That’s a very informative post! Good that Nemit loves water, it makes job so much easier. My daughter cried at the sight of water, she started swimming only when she was 5 and then too after much cajoling. 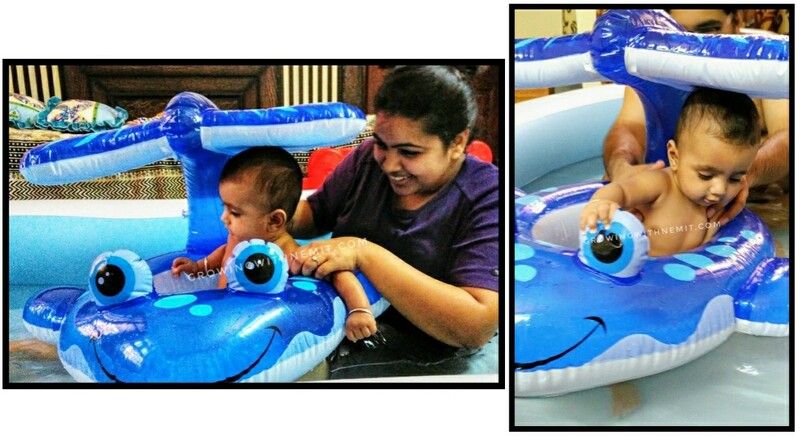 Though now she swims very well, I sometimes think that playing with a baby or toddler in the pool is so much more fun. Your post is like a handy guide for parents to know pool essentials for kids. Good one. Sending best wishes to your kid. I have always loved the water but too scared to swim! that’s today’s oxymoron for you. Lovely post and lots of info on kids water play toys. I love this post for many reasons… I totally love the pool at home concept. I have tried it with a smaller one ( not as big as yours) and it’s fun and safe. I like the checklist of items to have on hand. Very interesting, might be helpful for new mothers. Love to swim. A very comprehensive list. Boy, does your son love him some pools. Your list is good and practical. I never knew about swimming diapers. Going to use those! Neha, such an informative post on pool essentials. It was an interesting read. Thank you for also adding the relevant details about the various items. One query… how did you manage to post a video on your post. I have often tried to do so, but have never been able to do so. Thanks again. Hello Deepti, thanks for stopping by. I have embedded the video from Facebook directly. You get an option to embed in the post, just copy the link in html column on your blog. This is a very informative post though I must tell you that swim diapers are really the biggest scam on this planet. Once my grandson had run out of diapers so we used a swim diaper and that night we had the biggest pool ever! A paddle pool is really a good idea to take to grandparents’ houses because they generaly don’t have anything to keep baby amused. My son is 2.11 years and he loves pools. Your post took me back to his journey of falling in love with water. Informative post and lovely pictures. Very detailed post Neha. Will reference it next time I am going on holiday. My kids love the water too and the indoor pool idea is gr8 but no place in our current house. kids do love water…and when I say kid I am talking about all of them including the one we pretend to hide inside us :). I have purchased many things from amazon to make the water experience as enjoyable as possible to my little daughter. However I also miss a pool nearby!!! Quite an informative post Neha! I’ve started at a later stage with my kid. It must be great fun to have a pool time with the babies and agree to the point that the babies get comfortable and learn swimming soon as early as we make a start. You have mentioned almost everything. In our last vacation we carried all this. And kids had a super time in the pool. My nephew is a water baby as well, & the swim diaper bit is so useful! We had an inflatable pool at home for our daughter too. We had placed some ducks and other toy sea animals so her playtime had some learning included in it. Agree that kids must be made comfortable while stepping into water. Your son is adorable. He makes for a cute water baby. 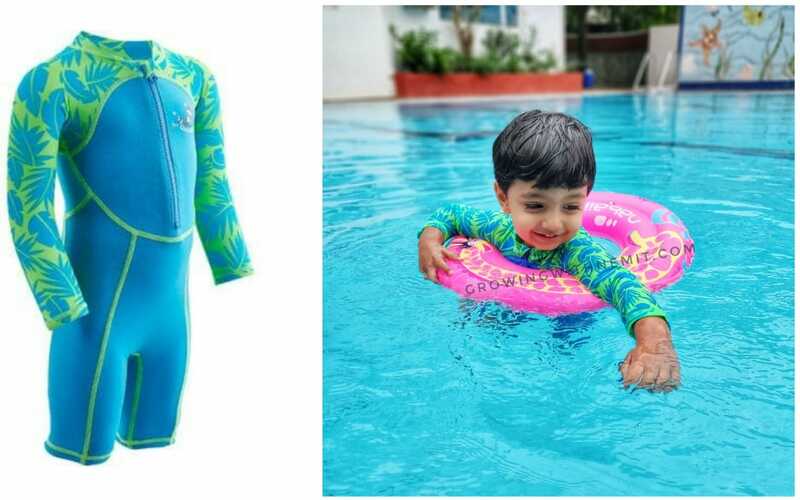 A detailed post for parents to choose the right kind of swimming gears for their kids. Its always good to introduce your kids to swimming as early as possible. Lots of things are covered in this post. A complete guide for moms. That’s a detailed post and loved the list of articles.. we have most of these and I couldn’t agree more with you. Beautiful pictures of Nimit enjoying water and swim. I love the inflatable pool in his room, Mumbai and such populated places doesn’t allow us the luxury of having swimming pools at near proximity. Thanks for sharing the list of pool essentials with us. A very informative post with a handy check-list for new moms. These pictures rekindled the childhood memories of my son and the time spent with him in the pool 🙂 Thanks for that! Really useful post. I love the idea of having a pool in the room. Its perfect for kids. I wish I had done that whn T was smaller. But do u think this pool is good enough for 2 to 3 yr olds too? We also dont have a pool where we live and I want him to get to love water. I feel this pool is big enough to have some relaxed pool time but it’s not suitable for swimming. It will just serve as a big bath tub for 2-3 year old, so can be used for some water play but definitely not as a pool. Useful handy list. Thanks for sharing Neha. That inflatable pool you bought for Nemit’s room looks fabulous. What an informative and useful post. O I use to always wonder what If the child pee in the pool. Thanks for sharing the essentials. 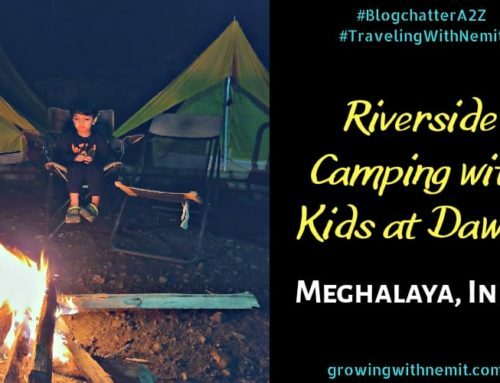 A very detailed out post neha… It’s very informative. You have actually provided a check list of do’s and don’t. I am definitely going to refer this post again when I take my kid to the pool. This blog came up just in time.Thank you.The links to where the products can be bought from is also very helpful. 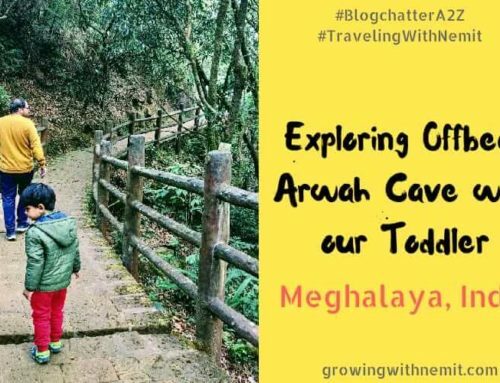 Really a lovely and useful post for young mothers! Well thought out list of essentials, I think you covered everything! Handy list for parents with small kids. Informative post neha. This is an exhaustive post with all the necessary information packed into one lovely bundle! Luckily, we have a pool in our society which is also well maintained. Come summer and my kids refuse to come out of it even after playing for more than an hour. Splashing water is great fun and Nimit is so aqua friendly! Lovely pics and informative post. Absolutely I have been trying with my girl from last 3 years and she never tried to move to the higher pool.We started her swimming lessons but stopped and now suddenly she super loved the pool. My niece also loves water like your son and she is 8 months old. I am sharing it with my sister so that she keeps in mind which things to kept while taking her out for a pool session. That pool is supercute! It is in fact good to introduce them to the pools at an early age. Even better that you did some checks before actually leaving for your trip to Goa. Useful tips before taking kids to the pool! Swimming is not only very enjoyable, it is good exercise for both chil seen and grown ups. Nice tips for parents of toddlers and babies who are going for swimming. You have done a great job, I would save this idea when we have a baby 🙂 bathtub area as a play zone. Loved the slomo jump in the pool. Bookmarked your blog for the time we plan a beach vacation! The list will come in handy. Thanks! Making the pool at home a play area in winter is one of the best ideas. This post has such good advice the most important being that never to force your child to do anything. They should enjoy and play. Then only they will learn. Nemit is so cute! I can see how much he enjoys playing in water. Liked the idea of turning the pool into a play pen. Your little one does look thrilled to be in the pool! Thank you for the informative post! I am sure many parents can relate with you. My little girl loves her bath time, but I am scared to take her to the pool. You have given me a good idea to prepare myself to see my baby girl enjoy her pool time Neha. Here in the USA, the summer is soon ending. I completely agree with your list. Proper swimwear, swim ring and sunscreen are a must. These are absolute essentials for kids venturing in pools. My son has the same swimming trunk from Decathlon. That’s a detailed and informative post, Neha. Even my son loves playing in the pool and we had done a similar thing at home gathering 3 of his friends and see them have a fun time. A very comprehensive blog post. Informative one. Even I want to introduce my toddler to swimming pool. He recently saw beach and had a great experience.I would take him to pool soon, your post gave me the push. A good informative post, covering nearly all the aspects. Really like the way you showcased your personal experience. Keep the good work going. 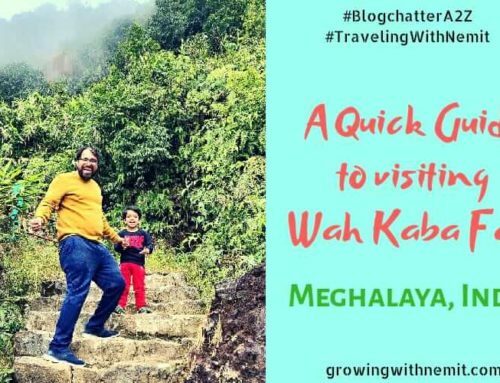 Do visit http://www.manasmkul.wordpress.com and share your experience. Very informative post! Although I don’t have children of my own, you can always suggest! Most of the Children love to play in water but we Indian parents worry a lot about their safety. That may be the reason , why Indians hardly ever win any Olympic medal in Swimming. I am sure Nemit will win it..Your list of pool time essentials is quite handy for parents. Such a detailed and well researched post. Cool pictures. We too had inflated pool for my son during his childhood. He loved it the most. I am sure I had commented here, but now i cannot find my comment! WHat an exhaustive checklist and a good one. 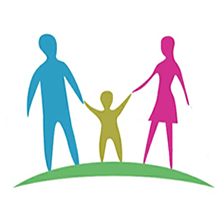 A great resource for new moms. my daughter is all grown up but I can recommend all the products that you have written about. A very good post. 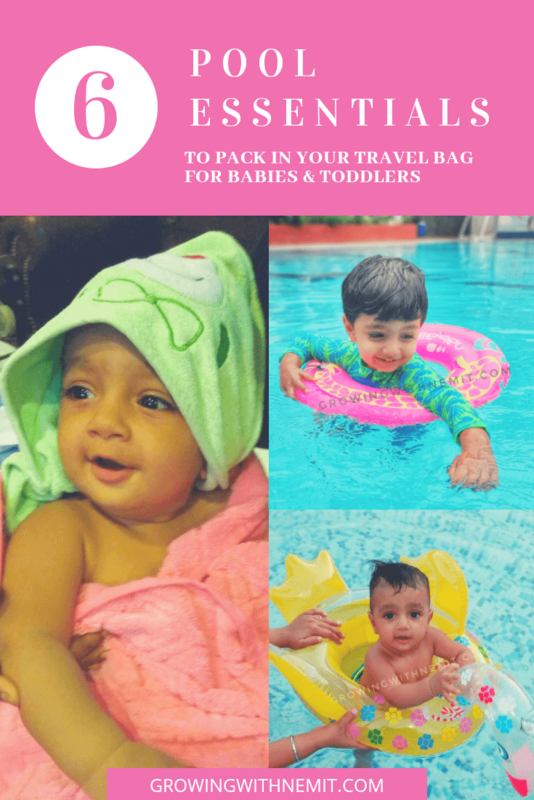 Extremely useful and detailed post for mommies who need to pack quickly for their toddlers. 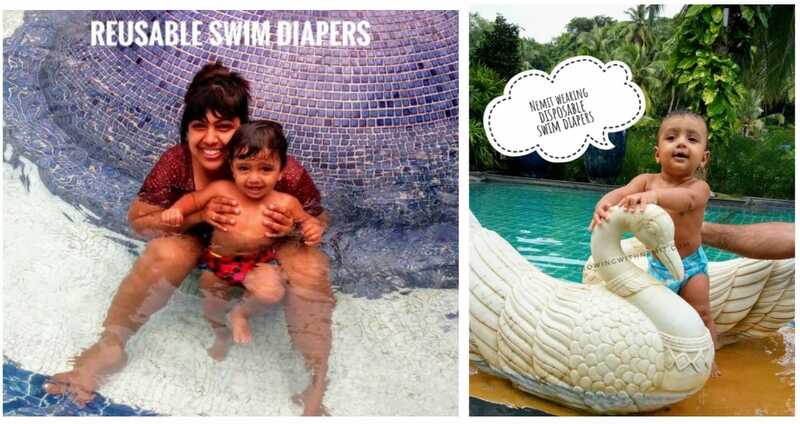 Loved the mention of swimming diapers, when my child was smaller, no one told me about this magical product. Luckily, I discovered it while shopping one day. Looking forward to reading more posts from you. Thank you very much for this beautiful information, i m a new mother, and will definately try this out. i loved reading this blog. This week we are traveling for the first time with our twins and this is quite helpful. thanks a lot! I loved the post.I too wanted to buy a home inflatable pool.but was afraid of the mess I could make.Great tips. wow such a detail and informative post Neha, all points covered beautifully. lots of love to nemit. Great post for those vacationing with kids. Not yet blessed with kids but surely going to share it. Looks like I will be gearing up for GOA trip soon too. Saved this post and will keep it as a checklist 🙂 My toddler is such a water baby. Very helpful post dear. Will keep these all in my mind for my next vacation.